Drawing on the Mailman School of Public Health’s distinguished faculty, Martins planned a series of lectures featuring experts in each of the topic areas covered in the course. The lectures were placed online for students to access up to a week before they would come to seminar session. This gave students the opportunity to watch the videos on their own time and supplement the lectures with additional reading. In addition to watching the videos, Martins incorporated web-based JiTT exercises where students were asked to apply the concepts from these lectures to short problem sets. Then they submitted their answers and any additional questions they had. Responses to these JiTT exercises helped TAs decide which topics to focus on in the seminar sessions. We had the chance to talk to Martins and the team of TAs about their teaching experience. We also heard from several students about the impact these course innovations had on their learning. What are the goals and objectives for your course? Martins: Principles of Epidemiology is a basic introductory level course for master’s students to get familiar with epidemiology. We know that most of the students in this class are doing their master’s in other areas of public health so we want them to develop critical thinking toward epidemiology and be able to understand an epidemiological study and research papers, and to be able to critically assess these studies and papers. Why did you apply for the Provost’s Hybrid Learning Course Redesign and Delivery RFP? Martins: We had been thinking of applying for the Request for Proposals for a while particularly because we thought that a three-hour class was too long for students and we had gotten feedback from our students confirming this. Most of the students were full-time or part-time workers besides being full-time students and coming from an hour-and-a-half lecture to an hour-and-a-half seminar session, so they didn’t have time to absorb the content. We were trying to think of ways of organizing the content that would be more beneficial to their learning. Jonathan Platt, Senior TA Seminar Leader and doctoral student at the Mailman School of Public Health, interacts with a small group of students in the seminar session. Photo courtesy of Jason Guzman, Center for Teaching and Learning. How did students benefit from this redesign? Eva Siegel, Seminar Leader: The flipped classroom design was beneficial in that it allowed students to review materials at home and then come to seminar to address any of the questions and concerns that they might have. Once content was clarified, students would apply the theoretical concepts to problem sets so they got the chance to see how epidemiology works in practice and how they might be able to apply these concepts in future research. Collaboration was also a big part of this course. It allowed students to see each other’s strengths and weaknesses, and learn from each other. In addition to a group project that they worked on together they also worked together to solve problem sets during the seminar sessions. I think this was important for them because when you work in research, you work in collaboration with others. How did you evaluate the effectiveness of this course redesign and assess that students were learning? Linda Kahn, Co-Instructor: We used a variety of instruments to look at students’ engagement with the new course format but also to measure how we were meeting course objectives. To get a sense of how students saw their own growth throughout the semester we surveyed them on their knowledge, skills, and attitudes about epidemiology, and the course structure in the beginning and end of the semester. We also used an observation tool that provided an inventory of the types of behavior students and instructors were displaying during a class session. This allowed us to reflect on the kind of engagement opportunities we were creating. Finally, we created rubrics that were mapped to course objectives as a way of grading the JiTT questions. This allowed us to be sure we were meeting course objectives and allowed for standardization among TAs. As a student how did you feel about the structure of this course and the online elements? Grant Conway, Student: I thought that I would be more motivated to listen to the lecture if it was in a classroom but I quickly adjusted to the format. I found that I could watch the lecture on one side of the screen and take notes on the other side. What was most helpful was that if the lecturer was emphasizing something, I could pause the lecture and go back and take closer notes. And then I really appreciated how class time was spent on discussion and clarifying areas of misunderstanding. This course redesign is a collaboration between Professor Silvia Martins and the Columbia University Center for Teaching and Learning with the support of the Provost Hybrid Learning Course Redesign and Delivery grant. The project includes a series of lecture videos, a Just-in-Time-Teaching component, and a mixed methods evaluation approach measuring the effectiveness of the redesign. Work involved: CTL staff recorded lecture sessions, edited and published lecture videos, and participated in technology and course redesign meetings. Lectures were recorded the semester prior to the redesign. 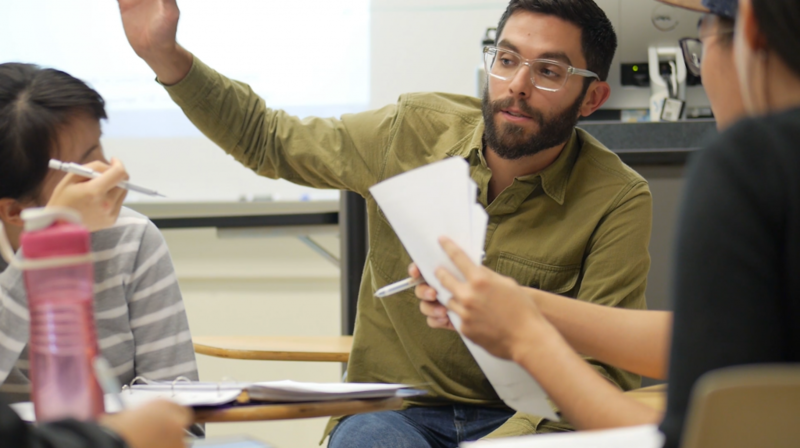 A CTL Learning Designer met with Martins and other class instructors regularly to redesign the course, develop assessments, and assist with technology. Next steps: Through a mixed methods evaluation of the course, Martins was able to measure engagement, student satisfaction, and other data points that speak to the effectiveness of the redesign. Next steps for this project include developing prologue videos that introduce and draw connections between the recorded lectures. The instructors are also interested in incorporating VoiceThread, a collaborative platform that will allow students and TAs to engage in asynchronous conversation around indexed segments of video. Contact the CTL at ColumbiaCTL@columbia.edu to learn about opportunities to develop similar projects or get support for using educational technologies in the classroom.